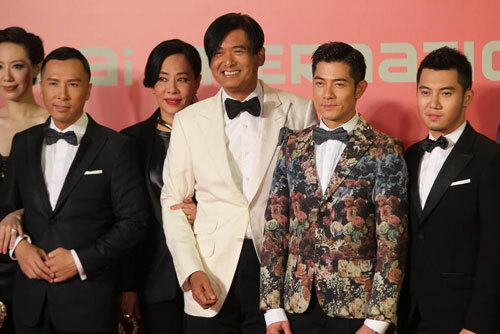 The 16th Shanghai International Film Festival (SIFF) kicked off on June 15 at the Shanghai Cultural Square and boasted a star-studded guest list that includes Chow Yun Fat (周潤發), Donnie Yen (甄子丹), Aaron Kwok (郭富城), Andy Lau (劉德華) and Jay Chou (周杰倫). 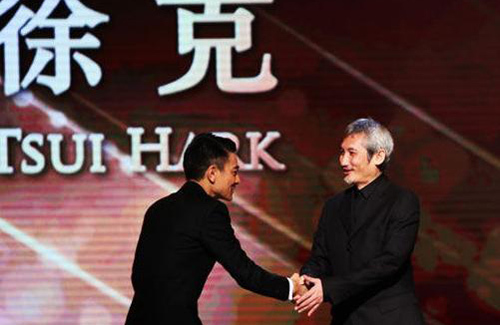 Veteran director Tsui Hark (徐克) was honored with an award for Outstanding Contribution to Chinese Film at the opening ceremony. Star-Studded Red Carpet Despite his unkempt hair, Fat Gor looked dashing in a white suit and his mega-watt smile. Together with wife, Jasmine Tan (陳薈蓮), the couple set many cameras flashing with their presence on the red carpet. Besides Fat Gor, Donnie and Aaron, the rest of the the actors from the upcoming 3D movie, The Monkey King <西遊記之大鬧天宮>, such as Joe Chen (陳喬恩), Peter Ho (何潤東) and Eddie Cheung (張兆輝) also made appearances. Even though Huang Xiaoming (黃曉明) has not fully recovered from his leg injury, he also attended the film festival with the rest of the cast from Mother Android <瑪德二號> and Amazing <神奇>. Although lead actress, Sammi Cheng (鄭秀文) was absent from the Blind Detective <盲探> entourage, Andy Lau, director Johnnie To (杜琪峯) and screenwriter Wai Kai Fai (韋家輝) promoted the film. Jay Chou (周杰倫) looked dapper in an embroidered suit as he made his appearance as a director as well as an actor for his role in The Rooftop <天台>. He also was involved in the music and choreography for the movie. Lovers Ni Ni (倪妮) and William Feng (馮紹峰) walked the red carpet hand-in-hand. In this acceptance speech, Tsui thanked his wife, Shi Nansun (施南生) as well as his working partners and film investors. The Shanghai International Film Festival will run for a total of nine days. Besides the red carpet and presentation of the Lifetime Achievement and Outstanding Contribution awards, the American 3D computer-animated film Monsters University was used as the opening film. A total of 14 films will compete for this year’s Golden Goblet. The jury panel headed by Oscar-winning British director Tom Hooper will decide the winner. Donnie Yen looks so fit in his suit. Damn. silly print on aaron! and chow yun fat needs a haircut. I thought Fatt Gor’s haircut looks good on him. Make him look younger.